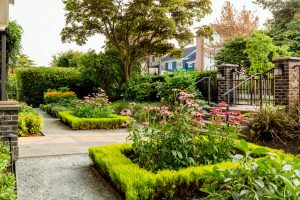 Seattle Landscape Architect Brooks Kolb is proud to announce the completion of an extensive new garden on Cascadia Avenue in the Mount Baker garden. The front garden features six rectangular perennial beds flanking the central front walk, while the much larger back garden boasts a substantial number of amenities: a swimming pool, shed with kitchenette, sports court and children’s play area. 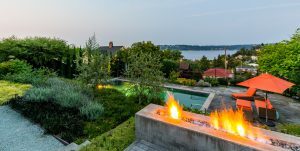 A raised hot tub is situated to look out over the flames of a custom, natural gas-fed fire feature to views of Lake Washington beyond. In addition, a custom tree house nestles in an Evergreen Magnolia tree for the owner’s young children. More than thirteen varieties of fruiting trees, shrubs, vines and espaliers are distributed throughout the garden, all without blocking views of the lake. Brooks collaborated with architect Kim Lavacot for the shed and tree house.